How can APIs affect a business? 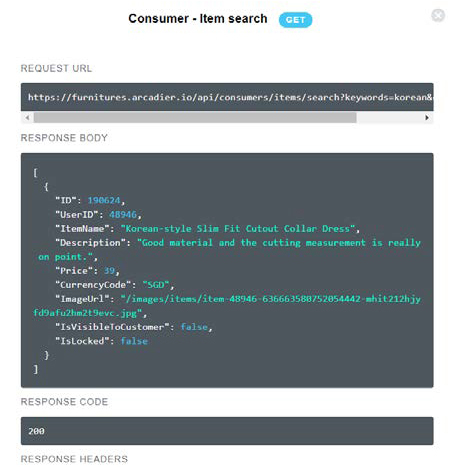 How can APIs affect your marketplace? We strongly recommend all users who want to develop to have their own sandbox marketplace created before upgrading to Growth package for APIs on their live marketplace. All sandbox marketplaces have API access and are free to use, they are only disabled for Live payments. This is so that you would be able to better test your custom features and save costs by only upgrading your subscription when you are ready! Go to the Arcadier Sandbox sign up page. Sign up with your preferred ID (Note: This will be the admin login for your sandbox as well!) and fill in the required fields. Also take note of the Currency selected as your sandbox marketplace will transact in this currency. Complete the sign-up flow by filling in the rest of the required fields. You will receive an email indicating that your marketplace has been successfully setup and you may now login to the Admin Portal! Go to Account Settings, then Account Info. Your Client ID & Secret will be displayed on the bottom of your account info. Note these down but remember to keep Client Secret a secret. More details about Client ID and Client Secret can be found here . Our full list of available APIs can be found in the left column of the swagger page. The marketplace here had 8 categories. Choosing topRows to be 2 caused the API to GET the 2 first categories. If it was chosen to be 4, the API would return the top 4, etc. For this particular marketplace, choosing topRows as 8 will display all categories. Other APIs with similar parameters can be found in the documentation. 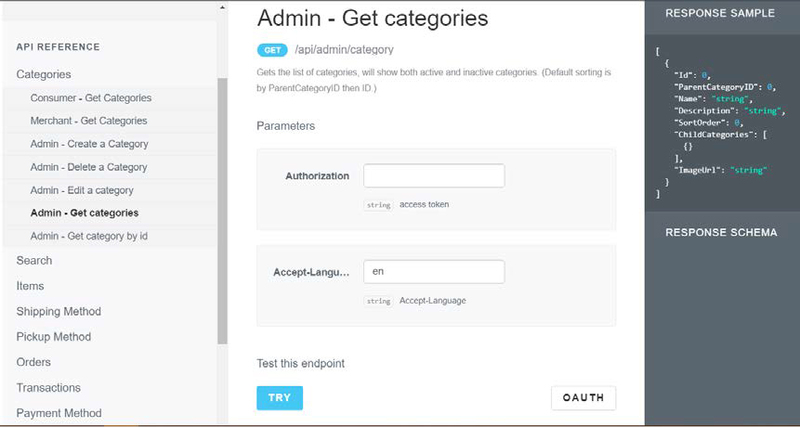 For these APIs, a specific parameter will be asked and sometimes a 2nd or 3rd parameter. 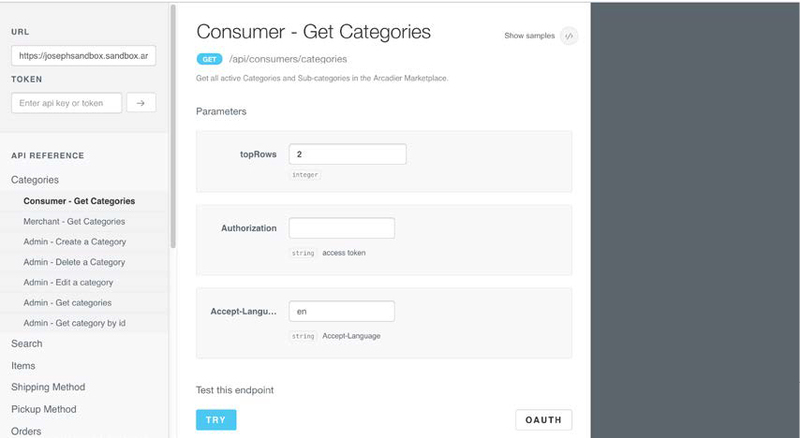 The category ID was obtained from the response of Consumer - Get Categories API. Note down that category’s category ID. 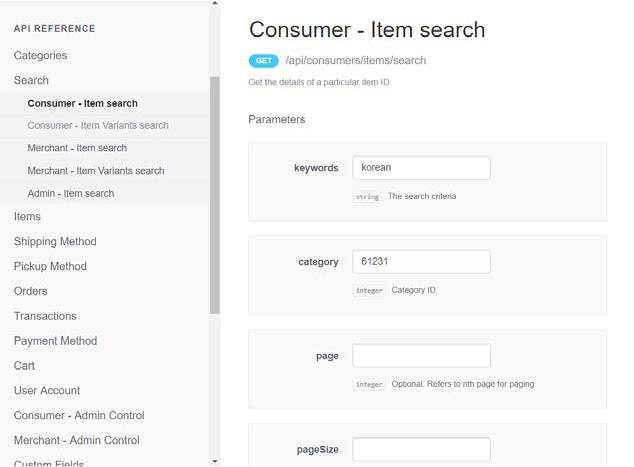 Other APIs such as ‘Order history’, ‘Order details’, ‘View carts’, ‘Add an item to shopping cart’, ‘Update a cart item’, ‘Remove an item from shopping cart’ and ‘Check out’ require authorization. Choosing any of these scopes would require you to login (NOT CREATE A NEW ACCOUNT) with the credentials, then you will be redirected ack to the swagger page, with an Access token, and the OAUTH button will change to SIGNOUT. Clicking on “TRY” will request the API to get a list of all Categories along with a set of properties of each category. This marketplace has 8 categories; so, 8 Categories were displayed along with each category’s properties. A random number generated that will be compared to other categories to sort them in order. This number will be assigned to categories depending on their order of creation. The different sub categories that belong to this category. means there are no sub categories. The URL of the category’s image in our servers. 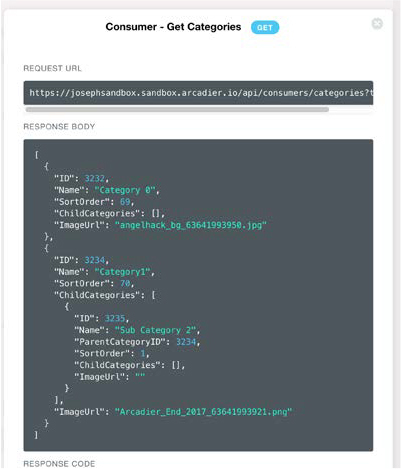 Other APIs will have different attributes in their responses. What they mean and what type of variable they need to be can be found in our API documentation.